It was a frustrating Tuesday for 2 of the goalie prospects of the New York Rangers and New York Islanders as 1 got stuck with a loss in relief and the other played well despite it being an exhibition game. 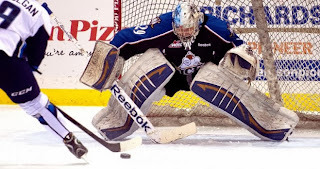 First Mackenzie Skapski (NYR 2013 6th) took a shootout loss when he gave up 1 goal in the shootout to the Lethbridge Hurricanes losing 5-4. Skapski came in to relieve starter Wyatt Hoflin who was yanked at the 14:20 mark of the 1st period after giving up 3 goals on 13 shots. Skapski came in and stopped 23 of 24 shots in 50:20 of action. Still Skapski gave up 1 goal in the shootout and thus gets hit with a shootout loss in the stats. Skapski is 9-9-2-1 with a 2.81 goals against and a 0.910 save percentage. Still the Ice had no business losing to a team that entered this game 5-27-2-3 which is the worst record in the entire WHL. Brady Skeji (NYR 2012 1st) and Team USA faced off in an exhibition game against Stephon Williams (NYI 2013 4th) and the Minnesota State Mavericks of the WCHA. Williams played a pretty solid first 2 periods holding Team USA to just 1 goal on 16 shots before giving way to his backup in the 3rd period. Team USA needed overtime before squeaking out a 3-2 overtime win. If I was Team USA I would view this game as a loss only able to get 3 goals on 30 shots against a 2nd and 3rd string goalie. Skjei was scoreless on just 1 shot as Team USA is headed off to Europe where they will make the cuts to get the roster down to 23 players. Finally Kyle Burroughs (NYI 2013 7th) remains out with a concussion missing his 7th straight game with a concussions for the Regina Pats. Get well Kyle but take your time doing so.